Welcome to New York, no smoking. Hotels and motels in New York may no longer offer smoking rooms if a bill proposed by state lawmaker Ken Zebrowski passes. The measure, which was introduced last week, was brought about by Zebrowski's personal experience. "I travel and spend a lot of time in hotel rooms," Zebrowski said. "I've noticed that if you're above, below or next to a smoking room, the smoke readily travels through the ventilation system." Zebrowski said the legislation was in line with the current focus on improving public health. "It's important to protect people when they're in an enclosed environment and they're subject to the behavior of others, as in a hotel or motel room," he said. "Venting systems just aren't sufficient to clear the air." The assemblyman also said smokers have become accustomed to going outside to smoke. Although he just made the proposal, Zebrowski thinks he'll receive support within the legislature, especially since he's not someone who's heavily targeted smoking in the past. He also said the American Lung Association and POW'R Against Tobacco, a local anti-tobacco group, had given him their support. In a statement, the lung association said the ban would help not only hotel guests but workers as well. 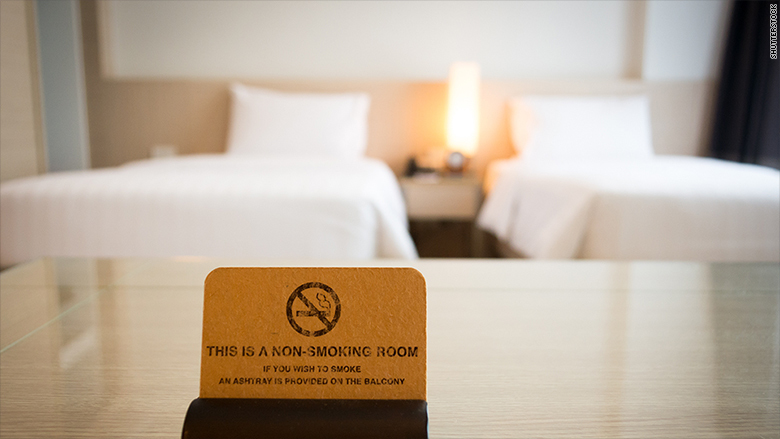 If the bill passes, New York would join four other states that prohibit smoking in hotel rooms: Michigan, North Dakota, Vermont and Wisconsin. Several national chains such as Marriott (MAR), Westin and Hilton (HLT) already ban smoking in all of their locations. The New York State Hospitality & Tourism Association said it had no comment and was still in the process of reaching out to its 1,300 members to gauge reactions. The Hotel Association of New York City, which has over 270 hotels as members, could not be reached for comment.